Before we draw out all the different costs for different materials, there are a few general factors that will affect the driveway paving cost estimate. Your location. If you live in a more expensive area, your price will be higher, and if you live in a lower cost area, your price will be lower. This is a factor that’s obviously out of your control. However, if you are able to combine with other homeowners on your street to get multiple jobs done, you may be able to save money as a whole due to the convenience you offer a potential contractor. The contractor you hire will have an obvious effect on the price you’ll pay. If you consult with different contractors, you’ll get different bids for the job. Usually, quality will correlate with cost – in other words, you’ll get what you pay for. When searching for contractors, make sure to get three bids. Most people default to the middle bid, but don’t necessarily do this without carefully evaluating what the contractor is offering – and, more importantly, what he may be leaving out! The driveway materials you choose. This will be discussed in more detail below, but your driveway paving cost will depend on what kind of material you want to pave your driveway. In addition, there can be some variation even within materials, depending on the manufacturer and type of material you choose within a certain category. Don’t forget that there may be maintenance costs associated with the material and project. For instance, asphalt will require periodic resealing to look nice; concrete pavers, on the other hand, are near maintenance free. The design/pattern. The more complex the design, the higher the price, as it will require more skill on the part of the contractor. Let’s take concrete pavers, for instance – the more complex the pattern, the more cuts need to be made (usually). Cuts take FOREVER to complete, just because they need to be marked, cut, and replaced individually. This will add to the expense of your project. Time of year. The paving driveway cost will be lower if you get the work done during non-peak times of the year. Shoot for the fall and winter if possible, as the spring and summer are quite popular (especially after tax season when everyone is flush with checks). Details of installation. If there are some difficulties in excavation, or if something else makes the job more difficult than a standard job, you may have to pay more. For instance, if your driveway area needs to be regraded in order to prevent flooding, this will be an extra expense on top of what you’d normally have to pay. How much you do yourself. If you are able to do steps of the process by yourself, you’ll save on labor costs. In addition, if you can obtain the materials yourself, you might be able to get a better deal on the materials, thus saving you money overall. First, you’ll have to pay to have the sub base excavated and installed. This will cost anywhere from $1 to $3 USD per square foot, obviously with some regional variations. This is also subject to how difficult or easy this step of the process is. This does not include any other work (like grading) that may have to be done in special circumstances. The next major factor that determines the price is the material you select. The more expensive materials will look nicer and will also require much more labor on the part of the contractor and his or her team. The most expensive kind of driveway paving material is cobblestones or other natural stones. These are very expensive to purchase individually, and also must be laid by hand. These can run you anywhere from $10 to $50 USD per square foot or more! Brick and concrete pavers are next. Driveway pavers must also be laid by hand, but since they are manufactured they are cheaper, running about $8 to $20 a square foot. Next comes concrete, both regular, stamped, and colored. If you go with regular concrete, you could pay anywhere from $3 to $10 a square foot. If you want to get the concrete stamped or colored, expect to pay a few dollars more. 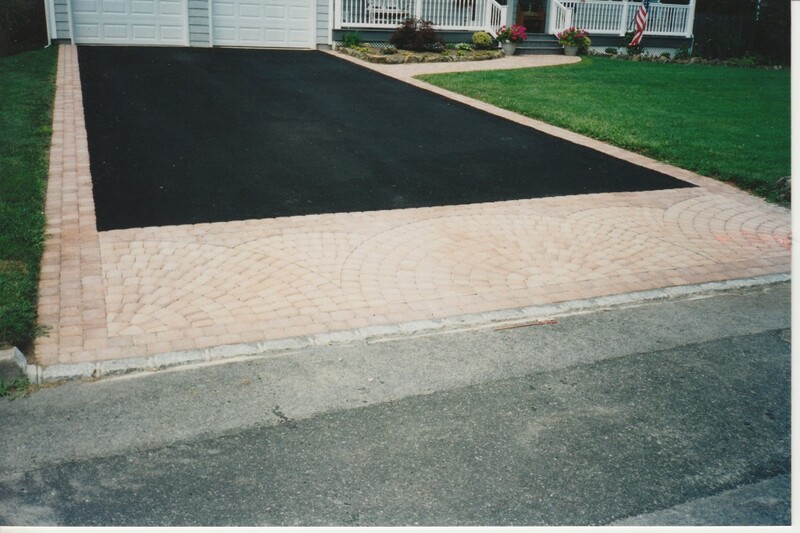 Asphalt paving driveway cost is next – look for around $1 to $6 per square foot for this. You also need to factor in replacement and durability. If a driveway cracks easily, requires heavy maintenance, and needs to be replaced more often, it may still cost a lot of money even if the initial installation is cheap due to all this additional work down the line. It may be worth it to pay more up front for a product that will last a long while. The final estimate you get will have to come from a contractor, as there are too many factors involved (as you see above) for me to give you a specific price on your job. A cost calculator can help you get a rough estimate, but it’s not something to totally rely on. In addition, a funny thing often happens when you want to get a simple driveway installed – other things and projects have to be done sometimes in order for the original project to be completed. For instance, the installation of retaining walls, changing of grades, and other adjustments may have to be done to ensure that the project is done right. This is impossible to predict without being able to see your particular job. That’s also why it’s so important to get a honest contractor who will be up-front with you on this – you don’t want to find out that you have to add a retaining wall before it’s too late! This entry was posted in Costs and Saving Money, Miscellaneous and tagged costs, driveway paving cost, driveway paving cost estimate, driveway paving costs, driveways, paving driveway cost by Will Grander. Bookmark the permalink.